Wild spirited teenagers surprise themselves decades later with this CD of close harmonies, true stories and adventures reflecting their love for life and each other. They've made old men cry, and young women laugh ... and vice versa. Their music, while almost all acoustic, is diverse in styles, from instrumental to A cappella, from story songs and love ballads to quirky autobiographical tales. After 30 years of singing harmonies and writing songs together, Lindalou and Michael finally released their first collection of recordings including 5 songs by other favorite writers like Christopher Smith, Dave Carter and Loudon Wainwright III. Often requested when Lindalou and Michael perform are "The Endless Mile" by Julie Snow and "The Bramble And The Rose" by Barbara Keith, also on the album. But it's their original songs that tell their stories and open up their journals, should you care to take a listen. Lindalou and Michael Ryge met in 1973 at San Rafael High School in Northern California. Michael was already playing the guitar and writing songs and encouraged Lindalou to take up the flute and sing with him. Soon they were writing songs together. Eventually they moved a little further north to live in the country and start a family. They continued making music on the side while working and raising their 2 sons. They've since taken up other instruments including harmonica and mandolin. They finally got their first CD recorded in 2003. They have continued writing songs and performing locally. They hope to record several more CDs someday! If you've never heard Lindalou and Michael play, give a listen! If you like what you hear, spread the word. They are available for house concerts, coffee houses, private parties, weddings and festivals. They often play at Farmer's Markets and benefits for the Arts, Education, and numerous Charities. They perform as a duo or with a full band of friends accompanying them. Featured on their first CD are Jimmy Bunch on dobro,Terry Ann Gillette on violin, Doug Harman on cello, and Christopher Smith on mandolin and a little bit of banjo. Their engineer from the Banquet Sound Studio in Santa Rosa, CA, Darryl Webb, plays piano, bass and even electric guitar and drums on one song. Michael sings & plays guitar and mandolin and Lindalou sings and plays flute and harmonica. Awesome debut album, each song is handcrafted! A great debut album from this dynamic duo!!! Each song is meticulously handcrafted and woven to perfection! Listening to their album just makes you feel great.! Can't wait until their next release!!! Great stuff ... these are folks you'd like to know! This is great stuff. Many listeners will hear a lot of themselves and their lives in Michael and Lindalou's songs. It's crazy, I suppose, to use the term 'musical' to describe music, but this is that. Skillful songcraft, great performances and lovely production values combine to bring out a real sense of personality, and yes, these are folks you would like to know! Sweet, honest, heart warming, It makes you smile. A must have. When you listen to this CD you can feel the love for the music and of the musicians. It's like listening to a life story, and a good one at that. When you're in heavy traffic and need to smile, slip this CD in, and your commute will be much better. 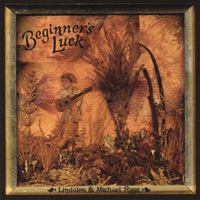 Beginner's Luck gives real meaning to the word, "Folk"
Lindalou and Michael Ryge's "Beginner's Luck" gives real meaning to the word "folk." Their tight harmonies and accompaniments with guitar, flute, harmonica and mandolin embelish the down-to-earth songs that talk about family, and love and hope. "Beginner's Luck" embodies a refreshing group of songs that give the listeners the feeling that each song was written for them.